Digital Framing Preview with Wizard's Integrated Framer Visualization Software! See your art framed before you place your order using Wizard's Integrated Framer Visualization Software. It’s the new way to frame! Here’s how it works: A camera mounted above our design table takes a digital photo of your art and several framing choices. With just a few mouse clicks you’ll see a rendition of the finished framing project on our computer! You can instantly compare frame and mat choices, sizes, textures, corner shapes and decorative V-Grooves. It's quick and easy! You can even see your own wall color behind your framing choice! 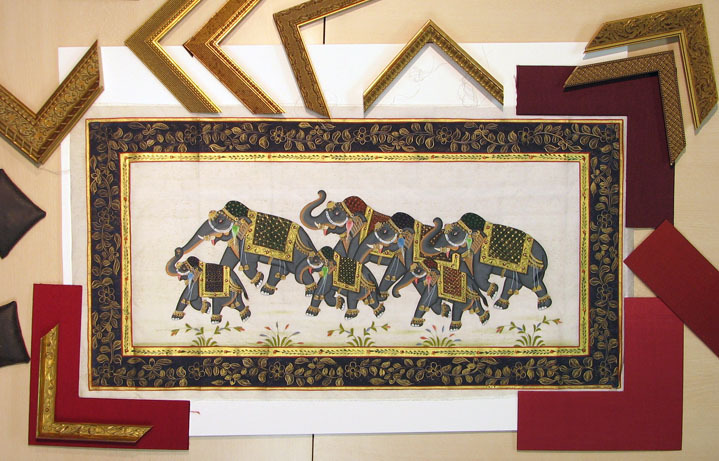 Our complimentary visualization service is just another way we make your framing experience comfortable and FUN! This hand-painted antique Indian painting on silk elephant motif Indian painting hand painted on silk was brought to us to be framed by the bride to be framed as a wedding gift for the groom. 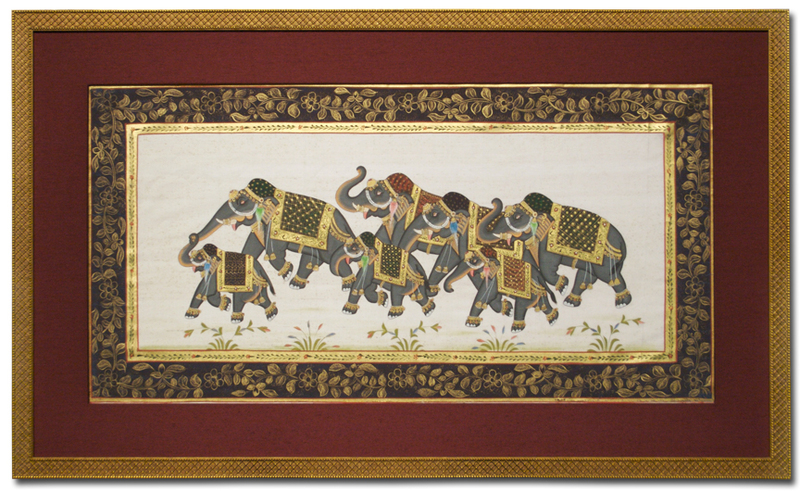 We decided that a hand-wrapped fabric mat and gold frame would work best for this piece. We placed a variety of framing and matting options around the art. 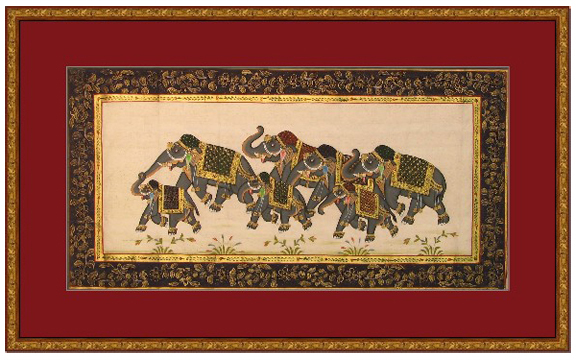 Option One depicts a blue silk mat and a 2" ornate gold frame Option Two shows a gold leaf floral pattern frame and a red linen mat. 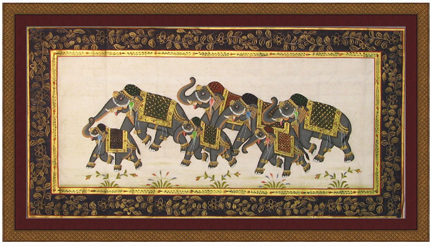 Option Three uses a deep marron Duponi silk mat and a gold frame with a subtle raised cross-weave pattern that echoes the pattern on the elephants' blankets. This version shows a 1" mat. Option Four is the same design as Option Three except the mat has been enlarged to give the art more breathing room. This was the customer's final choice. This is the final, finished frame, a magnificient wedding gift!